Common side effects include loss of appetite, constipation, dry mouth, dizziness, sweating, and sexual problems. Severe side effects include an increased risk of suicide, mania, and serotonin syndrome. Antidepressant withdrawal syndrome may occur if stopped. There are concerns that use during the later part of pregnancy can harm the baby. How it works is not entirely clear but it is believed to involve alterations in neurotransmitters in the brain. Venlafaxine was approved for medical use in the United States in 1993. It is available as a generic medication. In the United States the wholesale cost per dose is less than US$0.20 as of 2018. In 2016 it was the 51st most prescribed medication in the United States with more than 15 million prescriptions. Some doctors may prescribe venlafaxine off label for the treatment of diabetic neuropathy (in a similar manner to duloxetine) and migraine prophylaxis (in some people, however, venlafaxine can exacerbate or cause migraines). Studies have shown venlafaxine’s effectiveness for these conditions, although agents that are marketed for this purpose (like pregabalin or duloxetine) are likely preferred. It has also been found to reduce the severity of ‘hot flashes’ in menopausal women and men on hormonal therapy for the treatment of prostate cancer. 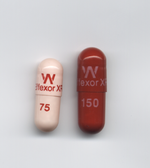 Due to its action on both the serotoninergic and adrenergic systems, venlafaxine is also used as a treatment to reduce episodes of cataplexy, a form of muscle weakness, in patients with the sleep disorder narcolepsy. Some open-label and three double-blind studies have suggested the efficacy of venlafaxine in the treatment of attention deficit-hyperactivity disorder (ADHD). Clinical trials have found possible efficacy in those with post-traumatic stress disorder (PTSD). Venlafaxine was similar in efficacy to the atypical antidepressant bupropion; however, the remission rate was lower for venlafaxine. In a double-blind study, patients who did not respond to an SSRI were switched to venlafaxine or citalopram. Similar improvement was observed in both groups. Venlafaxine is not recommended in patients hypersensitive to it, nor should it be taken by anyone who is allergic to the inactive ingredients, which include gelatin, cellulose, ethylcellulose, iron oxide, titanium dioxide and hypromellose. It should not be used in conjunction with a monoamine oxidase inhibitor (MAOI), as it can cause potentially fatal serotonin syndrome. People stopping venlafaxine commonly experience discontinuation symptoms such as dysphoria, headaches, nausea, irritability, emotional lability, sensation of electric shocks, and sleep disturbance. Venlafaxine has a higher rate of moderate to severe discontinuation symptoms relative to other antidepressants (similar to the SSRI paroxetine). The higher risk and increased severity of discontinuation syndrome symptoms relative to other antidepressants may be related to the short half-life of venlafaxine and its active metabolite. After discontinuing venlafaxine, the levels of both serotonin and norepinephrine decrease, leading to the hypothesis that the discontinuation symptoms could result from an overly rapid reduction of neurotransmitter levels. The development of a potentially life-threatening serotonin syndrome (also more recently classified as “serotonin toxicity”) may occur with venlafaxine treatment, particularly with concomitant use of serotonergic drugs, including but not limited to SSRIs and SNRIs, many hallucinogens such as tryptamines and phenethylamines (e.g., LSD/LSA, DMT, MDMA, mescaline), dextromethorphan (DXM), tramadol, tapentadol, pethidine (meperidine) and triptans and with drugs that impair metabolism of serotonin (including MAOIs). Serotonin syndrome symptoms may include mental status changes (e.g. agitation, hallucinations, coma), autonomic instability (e.g. tachycardia, labile blood pressure, hyperthermia), neuromuscular aberrations (e.g. hyperreflexia, incoordination) or gastrointestinal symptoms (e.g. nausea, vomiting, diarrhea). Venlafaxine-induced serotonin syndrome has also been reported when venlafaxine has been taken in isolation in overdose. An abortive serotonin syndrome state, in which some but not all of the symptoms of the full serotonin syndrome are present, has been reported with venlafaxine at mid-range dosages (150 mg per day). A case of a patient with serotonin syndrome induced by low-dose venlafaxine (37.5 mg per day) has also been reported. There are few well-controlled studies of venlafaxine in pregnant women. A study released in May 2010 by the Canadian Medical Association Journal suggests use of venlafaxine doubles the risk of miscarriage. Consequently, venlafaxine should only be used during pregnancy if clearly needed. A large case-control study done as part of the National Birth Defects Prevention Study and published in 2012 found a significant association of venlafaxine use during pregnancy and several birth defects including anencephaly, cleft palate, septal heart defects and coarctation of the aorta. Prospective studies have not shown any statistically significant congenital malformations. There have, however, been some reports of self-limiting effects on newborn infants. As with other serotonin reuptake inhibitors (SRIs), these effects are generally short-lived, lasting only 3 to 5 days, and rarely resulting in severe complications. Venlafaxine should be taken with caution when using St John’s wort. Venlafaxine may lower the seizure threshold, and coadministration with other drugs that lower the seizure threshold such as bupropion and tramadol should be done with caution and at low doses. Venlafaxine should be used with caution in hypertensive patients. Venlafaxine must be discontinued if significant hypertension persists. It can also have undesirable cardiovascular effects. Venlafaxine is usually categorized as a serotonin-norepinephrine reuptake inhibitor (SNRI), but it has been referred to as a serotonin-norepinephrine-dopamine reuptake inhibitor (SNDRI). It works by blocking the transporter “reuptake” proteins for key neurotransmitters affecting mood, thereby leaving more active neurotransmitters in the synapse. The neurotransmitters affected are serotonin and norepinephrine. Additionally, in high doses it weakly inhibits the reuptake of dopamine, with recent evidence showing that the norepinephrine transporter also transports some dopamine as well, since dopamine is inactivated by norepinephrine reuptake in the frontal cortex. The frontal cortex largely lacks dopamine transporters, therefore venlafaxine can increase dopamine neurotransmission in this part of the brain. 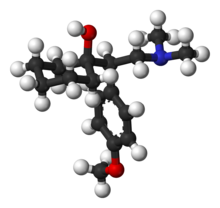 Venlafaxine indirectly affects opioid receptors as well as the alpha2-adrenergic receptor, and was shown to increase pain threshold in mice. These benefits with respect to pain were reversed with naloxone, an opioid antagonist, thus supporting an opiate mechanism. Venlafaxine is well absorbed, with at least 92% of an oral dose being absorbed into systemic circulation. It is extensively metabolized in the liver via the CYP2D6 isoenzyme to desvenlafaxine (O-desmethylvenlafaxine, now marketed as a separate medication named Pristiq), which is just as potent an SNRI as the parent compound, meaning that the differences in metabolism between extensive and poor metabolisers are not clinically important in terms of efficacy. Side effects, however, are reported to be more severe in CYP2D6 poor metabolisers. Steady-state concentrations of venlafaxine and its metabolite are attained in the blood within 3 days. Therapeutic effects are usually achieved within 3 to 4 weeks. No accumulation of venlafaxine has been observed during chronic administration in healthy subjects. The primary route of excretion of venlafaxine and its metabolites is via the kidneys. The half-life of venlafaxine is relatively short, so patients are directed to adhere to a strict medication routine, avoiding missing a dose. Even a single missed dose can result in withdrawal symptoms. The IUPAC name of venlafaxine is 1-[2-(dimethylamino)-1-(4 methoxyphenyl)ethyl]cyclohexanol, though it is sometimes referred to as (±)-1-[a-[a-(dimethylamino)methyl]-p-methoxybenzyl]cyclohexanol. It consists of two enantiomers present in equal quantities (termed a racemic mixture), both of which have the empirical formula of C17H27NO2. It is usually sold as a mixture of the respective hydrochloride salts, (R/S)-1-[2-(dimethylamino)-1-(4 methoxyphenyl)ethyl]cyclohexanol hydrochloride, C17H28ClNO2, which is a white to off-white crystalline solid. Venlafaxine is structurally and pharmacologically related to the atypical opioid analgesic tramadol, and more distantly to the newly released opioid tapentadol, but not to any of the conventional antidepressant drugs, including tricyclic antidepressants, SSRIs, MAOIs, or RIMAs. ^ a b “Venlafaxine international brands”. Drugs.com. Retrieved 22 June 2017. ^ a b c d e “Apo-Venlafaxine XR Capsules” (PDF). TGA eBusiness Services. Macquarie Park, NSW: Apotex Pty Ltd. 13 April 2012. Retrieved 6 November 2013. ^ a b c d e “Venlafaxine (venlafaxine hydrochloride) tablet [Aurobindo Pharma Limited]”. DailyMed. Aurobindo Pharma Limited. February 2013. Retrieved 6 November 2013. ^ a b c d e f g h i j “Venlafaxine Hydrochloride Monograph for Professionals”. Drugs.com. AHFS. Retrieved 24 December 2018. ^ “venlafaxine-hydrochloride”. The American Society of Health-System Pharmacists. Retrieved 3 April 2011. ^ Grothe DR, Scheckner B, Albano D (May 2004). “Treatment of pain syndromes with venlafaxine”. Pharmacotherapy. 24 (5): 621–9. doi:10.1592/phco.24.6.621.34748. PMID 15162896. ^ Mayo Clinic staff (2005). “Beyond hormone therapy: Other medicines may help”. Hot flashes: Ease the discomfort of menopause. Mayo Clinic. Retrieved 19 August 2005. ^ Schober CE, Ansani NT (2003). “Venlafaxine hydrochloride for the treatment of hot flashes”. The Annals of Pharmacotherapy. 37 (11): 1703–7. doi:10.1345/aph.1C483. PMID 14565812. ^ “Medications”. Stanford University School of Medicine, Center for Narcolepsy. 7 February 2003. Archived from the original on 21 August 2007. Retrieved 3 September 2007. ^ Ghanizadeh A, Freeman RD, Berk M (March 2013). “Efficacy and adverse effects of venlafaxine in children and adolescents with ADHD: a systematic review of non-controlled and controlled trials”. Reviews on recent clinical trials. 8 (1): 2–8. doi:10.2174/1574887111308010002. PMID 23157376. ^ Pae CU, Lim HK, Ajwani N, Lee C, Patkar AA (June 2007). “Extended-release formulation of venlafaxine in the treatment of post-traumatic stress disorder”. Expert Review of Neurotherapeutics. 7 (6): 603–15. doi:10.1586/14737175.7.6.603. PMID 17563244. ^ a b Cipriani A, Furukawa TA, Salanti G, Geddes JR, Higgins JP, Churchill R, Watanabe N, Nakagawa A, Omori IM, McGuire H, Tansella M, Barbui C (February 2009). “Comparative efficacy and acceptability of 12 new-generation antidepressants: a multiple-treatments meta-analysis”. Lancet. 373 (9665): 746–58. doi:10.1016/S0140-6736(09)60046-5. PMID 19185342. ^ Cipriani, Andrea; Furukawa, Toshi A.; Salanti, Georgia; Chaimani, Anna; Atkinson, Lauren Z.; Ogawa, Yusuke; Leucht, Stefan; Ruhe, Henricus G.; Turner, Erick H. (2018). “Comparative efficacy and acceptability of 21 antidepressant drugs for the acute treatment of adults with major depressive disorder: a systematic review and network meta-analysis”. Lancet. 391 (10128): 1357–1366. doi:10.1016/S0140-6736(17)32802-7. ISSN 1474-547X. PMC 5889788. PMID 29477251. ^ Thase ME, Clayton AH, Haight BR, Thompson AH, Modell JG, Johnston JA (2006). “A double-blind comparison between bupropion XL and venlafaxine XR: sexual functioning, antidepressant efficacy, and tolerability”. Journal of Clinical Psychopharmacology. 26 (5): 482–8. doi:10.1097/01.jcp.0000239790.83707.ab. PMID 16974189. ^ Lenox-Smith AJ, Jiang Q (2008). “Venlafaxine extended release versus citalopram in patients with depression unresponsive to a selective serotonin reuptake inhibitor”. International Clinical Psychopharmacology. 23 (3): 113–9. doi:10.1097/YIC.0b013e3282f424c2. PMID 18408525. ^ Courtney DB (2004). “Selective serotonin reuptake inhibitor and venlafaxine use in children and adolescents with major depressive disorder: a systematic review of published randomized controlled trials”. Canadian Journal of Psychiatry. 49 (8): 557–63. doi:10.1177/070674370404900807. PMID 15453105. ^ David Taylor; Carol Paton; Shitij Kapur, eds. (2012). The Maudsley Prescribing Guidelines in Psychiatry (illustrated ed.). John Wiley & Sons. ISBN 978-0-470-97948-8. ^ a b c “Effexor Medicines Data Sheet”. Wyeth Pharmaceuticals Inc. 2006. Archived from the original on 17 September 2006. Retrieved 17 September 2006. ^ Gibbons RD, Brown CH, Hur K, Davis J, Mann JJ (June 2012). “Suicidal thoughts and behavior with antidepressant treatment: reanalysis of the randomized placebo-controlled studies of fluoxetine and venlafaxine”. Arch. Gen. Psychiatry. 69 (6): 580–7. doi:10.1001/archgenpsychiatry.2011.2048. PMC 3367101. PMID 22309973. ^ Tiihonen J, Lönnqvist J, Wahlbeck K, Klaukka T, Tanskanen A, Haukka J (December 2006). “Antidepressants and the risk of suicide, attempted suicide, and overall mortality in a nationwide cohort” (PDF). Archives of General Psychiatry. 63 (12): 1358–67. doi:10.1001/archpsyc.63.12.1358. PMID 17146010. ^ Rubino A, Roskell N, Tennis P, Mines D, Weich S, Andrews E (2007). “Risk of suicide during treatment with venlafaxine, citalopram, fluoxetine, and dothiepin: retrospective cohort study” (PDF). British Medical Journal. 334 (7587): 242. doi:10.1136/bmj.39041.445104.BE. PMC 1790752. PMID 17164297. ^ a b “Overview for December 13 Meeting of Psychopharmacologic Drugs Advisory Committee” (PDF). Food and Drug Administration: Center for Drug Evaluation and Research. 16 November 2006. Archived (PDF) from the original on 16 March 2007. Retrieved 20 June 2007. ^ Emslie GJ, Findling RL, Yeung PP, Kunz NR, Li Y (2007). “Venlafaxine ER for the treatment of pediatric subjects with depression: results of two placebo-controlled trials”. Journal of the American Academy of Child and Adolescent Psychiatry. 46 (4): 479–88. doi:10.1097/chi.0b013e31802f5f03. PMID 17420682. ^ Brent DA, Emslie GJ, Clarke GN, Asarnow J, Spirito A, Ritz L, Vitiello B, Iyengar S, Birmaher B, Ryan ND, Zelazny J, Onorato M, Kennard B, Mayes TL, Debar LL, McCracken JT, Strober M, Suddath R, Leonard H, Porta G, Keller MB (April 2009). “Predictors of spontaneous and systematically assessed suicidal adverse events in the treatment of SSRI-resistant depression in adolescents (TORDIA) study” (PDF). The American Journal of Psychiatry. 166 (4): 418–26. doi:10.1176/appi.ajp.2008.08070976. PMC 3593721. PMID 19223438. ^ Petit J, Sansone RA (2011). “A case of interdose discontinuation symptoms with venlafaxine extended release”. The Primary Care Companion for CNS Disorders. 13 (5). doi:10.4088/PCC.11l01140. PMC 3267502. PMID 22295261. ^ Hosenbocus S, Chahal R (February 2011). “SSRIs and SNRIs: A review of the Discontinuation Syndrome in Children and Adolescents”. Journal of the Canadian Academy of Child and Adolescent Psychiatry = Journal de l’Academie Canadienne de Psychiatrie de l’Enfant et de l’Adolescent. 20 (1): 60–7. PMC 3024727. PMID 21286371. ^ Haddad PM (March 2001). “Antidepressant discontinuation syndromes”. Drug Safety. 24 (3): 183–97. doi:10.2165/00002018-200124030-00003. PMID 11347722. ^ Campagne DM (2005). “Venlafaxine and Serious Withdrawal Symptoms: Warning to Drivers”. Medscape General Medicine. 7 (3): 22. PMC 1681629. PMID 16369248. ^ Dunkley EJ, Isbister GK, Sibbritt D, Dawson AH, Whyte IM (September 2003). “The Hunter Serotonin Toxicity Criteria: simple and accurate diagnostic decision rules for serotonin toxicity” (PDF). QJM: Monthly Journal of the Association of Physicians. 96 (9): 635–42. doi:10.1093/qjmed/hcg109. PMID 12925718. ^ Kolecki P (July – August 1997). “Isolated venlafaxine-induced serotonin syndrome”. Journal of Emergency Medicine. 15 (4): 491–3. doi:10.1016/S0736-4679(97)00078-4. PMID 9279702. ^ Ebert D, et al. “Hallucinations as a side effect of venlafaxine treatment”. Psychiatry On-line. Retrieved 17 June 2008. ^ Pan JJ, Shen WW (February 2003). “Serotonin syndrome induced by low-dose venlafaxine”. The Annals of Pharmacotherapy. 37 (2): 209–11. doi:10.1345/aph.1C021. PMID 12549949. ^ Broy P, Bérard A (2010). “Gestational exposure to antidepressants and the risk of spontaneous abortion: A review”. Current Drug Delivery. 7 (1): 76–92. doi:10.2174/156720110790396508. PMID 19863482. ^ Nakhai-Pour HR, Broy P, Bérard A (2010). “Use of antidepressants during pregnancy and the risk of spontaneous abortion”. Canadian Medical Association Journal. 182 (10): 1031–1037. doi:10.1503/cmaj.091208. PMC 2900326. PMID 20513781. ^ Polen KN, Rasmussen SA, Riehle-Colarusso T, Reefhuis J (2013). “Association between reported venlafaxine use in early pregnancy and birth defects, national birth defects prevention study, 1997-2007”. Birth Defects Res. Part a Clin. Mol. Teratol. 97 (1): 28–35. doi:10.1002/bdra.23096. PMC 4484721. PMID 23281074. ^ Gentile S (2005). “The safety of newer antidepressants in pregnancy and breastfeeding”. Drug Saf. 28 (2): 137–52. doi:10.2165/00002018-200528020-00005. PMID 15691224. ^ de Moor RA, Mourad L, ter Haar J, Egberts AC (2003). “[Withdrawal symptoms in a neonate following exposure to venlafaxine during pregnancy]”. Ned Tijdschr Geneeskd. 147 (28): 1370–2. PMID 12892015. ^ Ferreira E, Carceller AM, Agogué C, Martin BZ, St-André M, Francoeur D, Bérard A (2007). “[Effects of selective serotonin reuptake inhibitors and venlafaxine during pregnancy in term and preterm neonates]”. Pediatrics. 119 (1): 52–9. doi:10.1542/peds.2006-2133. PMID 17200271. ^ Moses-Kolko EL, Bogen D, Perel J, Bregar A, Uhl K, Levin B, Wisner KL (2005). “Neonatal signs after late in utero exposure to serotonin reuptake inhibitors: Literature review and implications for clinical applications”. The Journal of the American Medical Association. 293 (19): 2372–83. doi:10.1001/jama.293.19.2372. PMID 15900008. ^ Karch, A (2006). 2006 Lippincott’s Nursing Drug Guide. Philadelphia, Baltimore, New York, London, Buenos Aires, Hong Kong, Sydney, Tokyo: Lippincott Williams & Wilkins. ISBN 978-1-58255-436-5. ^ Thundiyil JG, Kearney TE, Olson KR (March 2007). “Evolving epidemiology of drug-induced seizures reported to a Poison Control Center System” (PDF). Journal of Medical Toxicology. 3 (1): 15–9. doi:10.1007/BF03161033. PMC 3550124. PMID 18072153. ^ “Venlafaxine Side Effects in Detail”. ^ Khurana RN, Baudendistel TE (December 2003). “Hypertensive crisis associated with venlafaxine”. The American Journal of Medicine. 115 (8): 676–7. doi:10.1016/S0002-9343(03)00472-8. PMID 14656626. ^ Thase ME (October 1998). “Effects of venlafaxine on blood pressure: a meta-analysis of original data from 3744 depressed patients”. The Journal of Clinical Psychiatry. 59 (10): 502–8. doi:10.4088/JCP.v59n1002. PMID 9818630. ^ Edvardsson B (26 February 2015). “Venlafaxine as single therapy associated with hypertensive encephalopathy”. SpringerPlus. 4 (1): 97. doi:10.1186/s40064-015-0883-0. PMC 4348355. PMID 25763307. ^ Johnson EM, Whyte E, Mulsant BH, Pollock BG, Weber E, Begley AE, Reynolds CF (September 2006). “Cardiovascular changes associated with venlafaxine in the treatment of late-life depression”. The American Journal of Geriatric Psychiatry. 14 (9): 796–802. doi:10.1097/01.JGP.0000204328.50105.b3. PMID 16943176. ^ R. Baselt (2008). Disposition of Toxic Drugs and Chemicals in Man (8th ed.). Foster City, CA: Biomedical Publications. pp. 1634–1637. ISBN 978-0-9626523-7-0. ^ “Wyeth Letter to Health Care Providers”. Wyeth Pharmaceuticals Inc. 2006. Retrieved 6 August 2009. ^ Taylor D, Lenox-Smith A, Bradley A (June 2013). “A review of the suitability of duloxetine and venlafaxine for use in patients with depression in primary care with a focus on cardiovascular safety, suicide and mortality due to antidepressant overdose”. Therapeutic Advances in Psychopharmacology. 3 (3): 151–61. doi:10.1177/2045125312472890. PMC 3805457. PMID 24167687. ^ Hanekamp BB, Zijlstra JG, Tulleken JE, Ligtenberg JJ, van der Werf TS, Hofstra LS (2005). “Serotonin syndrome and rhabdomyolysis in venlafaxine poisoning: a case report” (PDF). The Netherlands Journal of Medicine. 63 (8): 316–8. PMID 16186642. ^ Bymaster, F. P.; Dreshfield-Ahmad, L. J.; Threlkeld, P. G.; Shaw, J. L.; Thompson, L.; Nelson, D. L.; Hemrick-Luecke, S. K.; Wong, D. T. (2001). “Comparative affinity of duloxetine and venlafaxine for serotonin and norepinephrine transporters in vitro and in vivo, human serotonin receptor subtypes, and other neuronal receptors”. Neuropsychopharmacology. 25 (6): 871–880. doi:10.1016/S0893-133X(01)00298-6. ISSN 0893-133X. PMID 11750180. ^ Sabatucci, Joseph P.; Mahaney, Paige E.; Leiter, Jennifer; Johnston, Grace; Burroughs, Kevin; Cosmi, Scott; Zhang, Yingru; Ho, Douglas; Deecher, Darlene C.; Trybulski, Eugene (1 May 2010). “Heterocyclic cycloalkanol ethylamines as norepinephrine reuptake inhibitors”. Bioorganic & Medicinal Chemistry Letters. 20 (9): 2809–2812. doi:10.1016/j.bmcl.2010.03.059. ISSN 0960-894X. PMID 20378347. ^ “Acute Effectiveness of Additional Drugs to the Standard Treatment of Depression”. ClinicalTrials.gov. 2008. Retrieved 21 November 2013. ^ Goeringer KE, McIntyre IM, Drummer OH (2001). “Postmortem tissue concentrations of venlafaxine”. Forensic Science International. 121 (1–2): 70–5. doi:10.1016/S0379-0738(01)00455-8. PMID 11516890. ^ Wellington K, Perry CM (2001). “Venlafaxine extended-release: a review of its use in the management of major depression”. CNS Drugs. 15 (8): 643–69. doi:10.2165/00023210-200115080-00007. PMID 11524036. ^ “Stahl’s Essential Psychopharmacology – Cambridge University Press”. Stahlonline.cambridge.org. Retrieved 21 November 2013. ^ MD, Theodore A. Stern; MD, Maurizio Fava; MD, Timothy E. Wilens; MD, Jerrold F. Rosenbaum (2015). Massachusetts General Hospital Comprehensive Clinical Psychiatry. Elsevier Health Sciences. p. 860. ISBN 9780323295079. ^ The Opioid System as the Interface between the Brain’s Cognitive and Motivational Systems. Academic Press. 2018. p. 73. ISBN 9780444641687. ^ Pae CU (December 2011). “Desvenlafaxine in the treatment of major depressive disorder”. Expert Opinion on Pharmacotherapy. 12 (18): 2923–8. doi:10.1517/14656566.2011.636033. PMC 2695227. PMID 22098230. ^ Shams ME, Arneth B, Hiemke C, Dragicevic A, Müller MJ, Kaiser R, Lackner K, Härtter S (October 2006). “CYP2D6 polymorphism and clinical effect of the antidepressant venlafaxine”. Journal of Clinical Pharmacy and Therapeutics. 31 (5): 493–502. doi:10.1111/j.1365-2710.2006.00763.x. PMID 16958828. ^ Parker G, Blennerhassett J; Blennerhassett (April 1998). “Withdrawal reactions associated with venlafaxine”. The Australian and New Zealand Journal of Psychiatry. 32 (2): 291–4. doi:10.3109/00048679809062742. PMID 9588310. ^ Uhr M, Tontsch A, Namendorf C, Ripke S, Lucae S, Ising M, Dose T, Ebinger M, Rosenhagen M, Kohli M, Kloiber S, Salyakina D, Bettecken T, Specht M, Pütz B, Binder EB, Müller-Myhsok B, Holsboer F (2008). “Polymorphisms in the drug transporter gene ABCB1 predict antidepressant treatment response in depression”. Neuron. 57 (2): 203–209. doi:10.1016/j.neuron.2007.11.017. PMID 18215618. ^ Whyte IM, Dawson AH, Buckley NA (May 2003). “Relative toxicity of venlafaxine and selective serotonin reuptake inhibitors in overdose compared to tricyclic antidepressants” (PDF). QJM: Monthly Journal of the Association of Physicians. 96 (5): 369–74. doi:10.1093/qjmed/hcg062. PMID 12702786. ^ DeVane CL (2003). “Immediate-release versus controlled-release formulations: pharmacokinetics of newer antidepressants in relation to nausea”. Journal of Clinical Psychiatry. 64 (Suppl 18): 14–9. PMID 14700450. ^ Staton, Tracy (13 June 2012). “Drugstores accuse Pfizer, Teva of blocking Effexor generics”. FiercePharma.